Johnson is a sculptor whose main focus is narrative stacked forms made of unglazed clay. Much of his work explores issues of environmental sustainability and the impact of human activities on endangered species. Both sculptures the Pennsylvania Convention Center acquired – Bulldog, shown here, and Elephant – are part of an ongoing series that reference themes of social mobility, institutionalized religion, cultural conflict, and our declining environment. 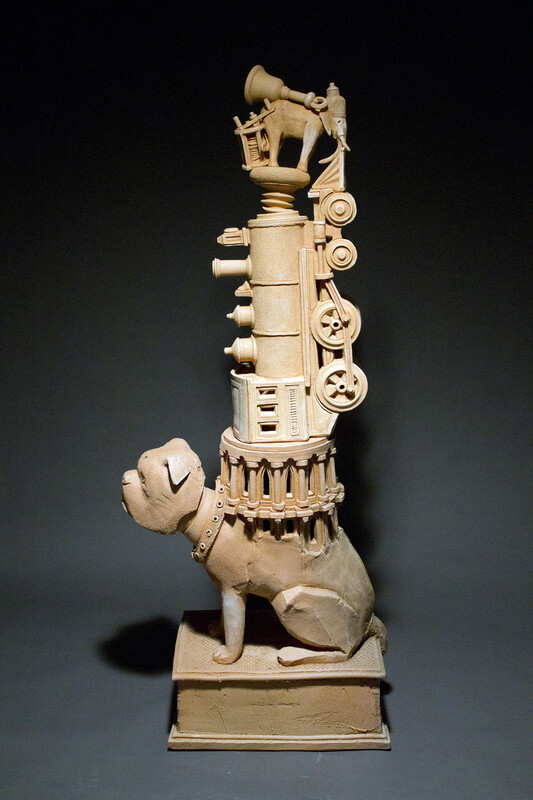 These ideas are combined with an interest in metaphorically loaded three-dimensional forms including Gothic architecture, industrial objects, wheeled toys, and endangered plants and animals. Johnson’s goal for this work is to draw attention to the various issues he is interested in by posing questions, not by answering them.